Lorien Stable - How hard do you hit the ground when you fall? your horse is galloping instead of standing still? Come to think of it, what if you just fall right off? Or if the horse is galloping and you just slip off, is it a harder fall than getting bucked off standing still? Okay, let's consider the question. 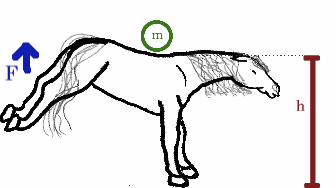 Say you're a rider of mass m on a horse who is h tall, and he bucks with a force of F.
The force F imparts a upwards velocity vbuck (that is, you are suddenly flying upwards). You go upwards more and more slowly, until gravity (g) has halted you at a height h2 above the saddle. Then you go back down. 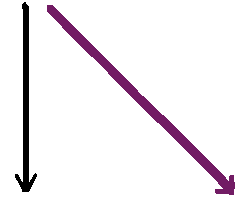 You are essentially falling from a standstill at a height d.
You fall a distance d=h+h2. 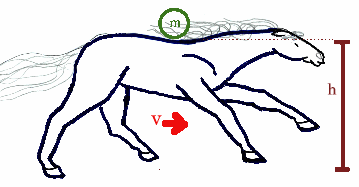 Okay, now suppose you are on a horse who is merrily galloping along at a speed v.
This horse now bucks with a force F.
For convenience, I am going to assume that air resistance doesn't make a difference in the short distance you're falling (it won't really), so v doesn't change. 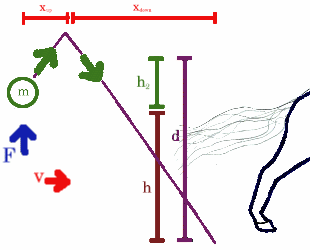 The force F imparts the same upwards velocity vbuck. However, instead of flying straight up, and then falling from a standstill, you go up the same distance...you just also go forwards a distance xup. Then, while you are falling from a height d, you are continuing to move forward a distance xdown. So--While the horse continues to run on out of your life, you're launched up out of the saddle, AND forwards. When you eventually hit the ground, you are falling down at the same speed as if the horse had been standing still...you are also falling *forward* at the speed the horse was running. You still fall a distance d=h+h2. Okay, so this is the difference in the fall: one goes straight down, one goes forward and down. The height of the fall is the same--the time of the fall is the same. vyimpact is the same in both situations; it's entirely dependent upon the height of the fall. 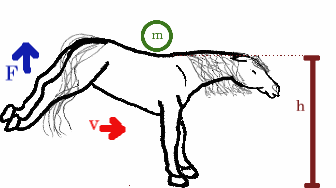 vximpact for the standing buck is 0; for the galloping buck, it is v.
If you skipped to the bottom for the answer, here it is! The force of landing is 151 pounds. The force of landing is 205 pounds. Yes, it makes a difference! But wait! Suppose that a running horse can't buck as hard as one standing still. The force of landing is... 185 pounds. Okay, now say, you simply fall off the galloping horse (no bucking). So, say he was running all out and hit maybe 30 mi/hr (44 ft/s), and then Fbuck=0. Now the force of landing is: 298 pounds! Force of landing: 114 pounds. How bad was YOUR worst fall? 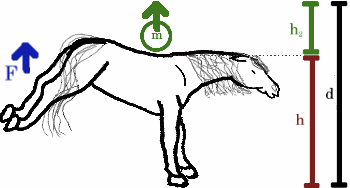 Speed of Horse (in feet/s) -- Use "0" for a standing buck or a simple fall.